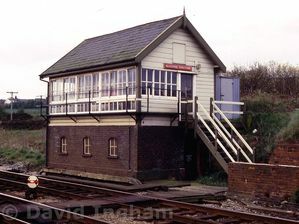 Blackrod Junction signal box was a Gloucester Wagon Company standard design fitted with a 34 lever Gloucester Wagon Company frame which was opened in 1881 by the Lancashire and Yorkshire Railway. A replacement 37 lever Lancashire and Yorkshire Railway Tappet frame was installed circa. 1891. 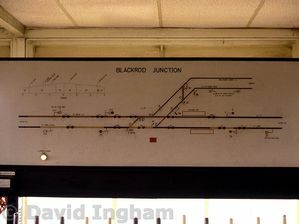 One thing remains a mystery, the signal box opened named Horwich Junction and was renamed Blackrod Junction, but when? The junction is named Horwich Junction on the 1909 Ordnance Survey 1:2,500 map and named Blackrod Junction on the 1929 Ordnance Survey 1:2,500 map suggesting the change took place sometime in the 20th century. But did the Ordnance Survey just not keep up to date with what was happening on the ground and the signal box named was actually changed in 1888 at the same time as the station was renamed from Horwich and Blackrod Junction to Blackrod? Or had confusion arisen in 1886 when the signal boxes at the three points of the triangle were named Horwich Junction, Horwich Loco Works Junction and Horwich Fork Junction, and the renaming took place as early as 1886? 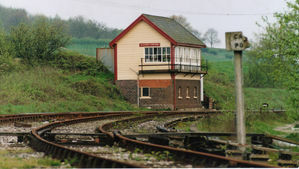 The signal box was refurbished with uPVC cladding and windows, with work starting on 24th January 2009 and was being completed during the following March. Closure was talked about many times and even planned in connection with conversion of land at Horwich works to a landfill site but there was never a strong enough desire official to overcome the problem the train describers systems at Preston and Manchester Piccadilly signal boxes “talking” to each other, the reason Blackrod Junction signal box signal box survived the closure of the Horwich branch for many years. Eventually the “talking” problem was solved and closure was scheduled for 20th January 2013, however the closure and associated work was postponed due to an official reason of extreme weather conditions. The signal box closed at 02:00 hours on 10th February 2013 with an official closure date of 11th February 2013 when the new signalling controlled by Manchester Piccadilly signal box was commissioned, and was demolished on 2nd June 2013. Thanks to David Ingham for this article, and to Chris Littleworth for his excellent book "Signal Boxes on Lancashire & Yorkshire Lines: North and West of Manchester", which provides the definitive reference source for signalling in the area. The following article was written for the Lancashire & Yorkshire Railway Society member publication Magazine, at the time of the bafflingly-timed refurbishment of Blackrod Junction Signal Box. In actual fact, Blackrod Junction box is not of L&Y design, since it dates from a period when the Lanky relied on other companies in such matters. It’s not entirely clear whether the Gloucester Wagon Co. cabin actually contained a matching frame from that company, or whether it was fitted with the current L&Y tappet frame from new. Suffice it to say that just one year from the supposed opening date of the box, that frame was in place, as it remains today. The date of opening is however the subject of some conjecture, with some sources quoting 1879 and others suggesting 1882. The earlier date seems the more likely though, because by 1882, the standard L&Y cabin design was in place and GWC were out of favour. The 1880 date of the L&Y frame does muddy the waters somewhat, but whichever way you look at it, Blackrod Junction Signal Box is old! Blackrod has (or at least had) some other unusual features, including an unusual 37-lever frame. 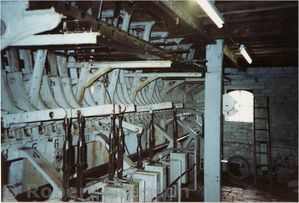 Although the "Lanky" manufactured sector-plates in a variety of sizes, from five levers down to one, the use of standard cabin sizes tended to result in a common numbers of levers being installed. 37 levers was presumably the maximum that could be accommodated by the GWC cabin. 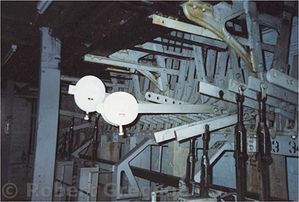 The L&Y frame survives to the present day, albeit with most of the levers painted white, not having been used for 25 years or more. Gone however, are the unusual curve-topped window frames, which were a feature of the GWC design. These have now been replaced by modern uPVC units which bear little or no resemblance to the originals. The wooden cladding has also gone in favour of a dazzlingly white modern alternative. The external walkway – considered unsafe for several years has, at the time of writing, been removed and seems unlikely to be reinstated. Overall, the box now has a decidedly modern and anonymous look about it. 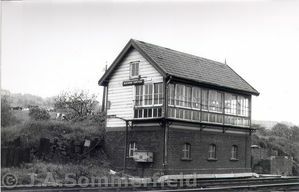 Blackrod Junction Signal Box – for it is still named as such, despite the absence of a junction – has very little to control these days, with just three electric light signals and a crossover under its sphere of influence. Fifty years go, things were very different though, with the junction to the Horwich Branch, coal sidings, a busy goods yard and exchange sidings for the Cooke & Nuttall Vale Paper Mill, all under the watchful eye of the Blackrod signalman. Added to that, were the Horwich Fork and Hilton House junctions only yards away, beyond the station – although Horwich Fork SB was directly responsible for those. By the 1950s, the coal sidings had found a new lease of life holding empty pulp wagons for the paper mill, with C&N’s own Barclay 0-4-0ST tripping the rakes of wagons up and down the tight, steeply graded line from the Vale works to the station environs. This loco, named "Douglas" after the river which flows along the railway line here, was preserved and is currently undergoing a slow restoration at Carnforth. It’s probably fair to say that at one time, the job of Signalman at Blackrod would have been a hectic one. Dr Beeching, as with countless other locations, took his toll on the Horwich Branch and by 1965, Horwich Station had closed after a little less than 100 years of passenger operation. With it, the Hilton House branch and Horwich Fork closed and the station yard, coal sidings and the Cooke & Nuttall’s line were quickly consigned to history. At that point however, despite having built its last locomotive, Horwich Works was still active and remained so for two more decades, as did the branch line. 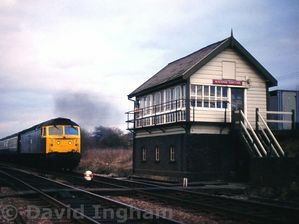 In 1972, Blackrod survived by the skin of its teeth as the first box in the Manchester signalling area, on the fringe of the area controlled by the new "Power Box" at Preston. 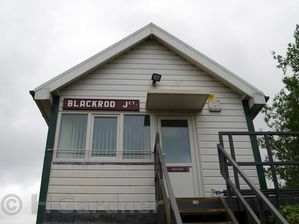 Blackrod was therefore responsible for passing trains from Preston to the network of mechanical boxes to the south, beginning with Blackrod and followed by Lostock Junction. 1984 saw the final closure of Horwich Works, and only the Foundy remained open, albeit in private hands and for a while, the line – now downgraded to "siding" status – remained in sporadic use. Costs associated with keeping the line open became prohibitive though, due in part to constant vandalism and theft, and the inevitable finally happened. 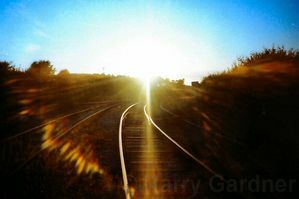 I have heard it suggested that the rails were not officially lifted, with the local thieves and scrap metal dealers doing the job for them! After that near-miss, it should have been all over for Blackrod when in 1990, the new electronic signalling system at Manchester Piccadilly came into use. Lostock Junction and numerous other boxes were swept away, but Blackrod, sandwiched between these two signalling Goliaths, remained. The reason for that miraculous escape is down to the fact that almost 20 years had elapsed between the Preston and Piccadilly designs. Sufficient time for the two to be totally incompatible and incapable of passing train details between each other! It was probably not an impossible task to "interface" Preston and Piccadilly, but was presumably deemed either impractical or, more likely, too costly. 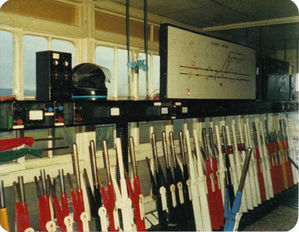 A low-tech solution was therefore employed which involved the signalman at Blackrod transferring train details between terminals of the two systems. A further 19 years down the line, and the situation remains. Railwaymen apparently refer to Blackrod Junction SB as "The Joke", but with so many Lancashire & Yorkshire boxes having lost their fight with advancing modernisation, it’s nice to see that Blackrod Junction still remains on the map. So what does the future hold for our local railway relic? The fact that Network Rail has spent a significant sum of money on the signal box, presumably indicates that they don’t have any plans to consign it to history just yet. Perhaps the planned replacement to Preston PSB in around 10 years time, will be the final nail in the coffin. If that does happen, it seems likely that the semaphore signalling down the line to Blackpool will also fall victim, but it’s best not to worry about such things. Not just yet anyway.